Evelyn Freyman passed away on February 16, 2004 at age 92. Mrs. Freyman was a founding member of the Washington-Baltimore local of AFRA (American Federation of Radio Artists) in 1940, and served as president of the local from 1941-48, and then as executive secretary of the AFTRA Local (American Federation of Television and Radio Artists) from 1948-83. She served as AFTRA National VP from 1945-54. Evelyn also represented the Screen Actors Guild (SAG) in the Washington Baltimore area. Evelyn and Myer Freyman moved to Washington from their hometown of Lexington, KY in 1937 when Myer accepted a position in President Roosevelt's New Deal administration. 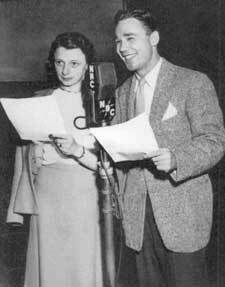 Evelyn started acting on stage and radio immediately, and with Johnny Batchelder co-hosted "Consumer Time" on the NBC Radio Network for nine years in the late 1940's and early 1950's. Former First Lady Eleanor Roosevelt co-hosted with Evelyn and Johnny during a portion of that run. Evelyn owned the Olney Theater from 1946-55. She allowed racially integrated audiences even as local authorities threatened to enforce segregation laws and close the theater. At AFTRA, Evelyn led contract and organizing efforts for every radio and television shop in the Local's area. In 1967 she organized the Network Correspondents through the DC Bureaus. Throughout her career, Evelyn was recognized as one of the most influential woman of American Stage and Broadcasting. The AFTRA Local she loved has grown from a dozen founders to 2600 active members.